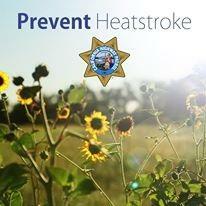 With blistering temperatures throughout the state, remember; never leave unattended children or pets in your vehicle. A vehilce can reach deadly temperatures in just minutes. If you have any road trips planned, carry a survival kit with extra water, concentrated food, cell phone and charger, sunscreen, matches, collapsible shovel, blankets, working jack, tools and basic extra parts for your car (e.g., hoses, fan belts, extra gas) and maps of your area.